Make the stock: heat the oil in a pan large enough to fit the chicken. Gently fry the ginger, garlic, lemon grass and spices for a minute then add the chicken and brown all over. Cover with water and bring to the boil. Skim off any scum, then reduce the temperature to a gentle simmer and cover. Cook for 1 hour or until the chicken is really tender. Remove the chicken. Return the pan to a high heat and boil the stock until it is reduced to about 600ml. Strain, cool and then chill until needed. Put the tamarind paste in a bowl. Add 300ml hot water and roughly break up with a fork. Leave to soak. Strip the coriander leaves from their stems. Seal the leaves in a plastic bag and refrigerate. Roughly chop the stems then process into a paste with the ginger, garlic, lemon grass and red chillies. Alternatively, finely chop each ingredient. Heat the oil in a pan and gently fry the onion until soft and golden. Mix in the herb and spice paste and gently fry for 3-4 minutes, then stir in the ground coriander and cook for 1 minute. Add the chicken stock prepared earlier and the coconut milk. Simmer gently while you finish the laksa. Strip the meat from the chicken, discarding the skin and bones Strain the tamarind paste and discard the stones. Cook the vermicelli according to the instructions. 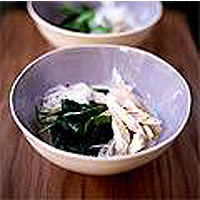 When ready to serve, add the tamarind liquid, fish sauce, chicken, spinach or pak choi and noodles. Return to a simmer and adjust the seasoning. If you like it hot, add the green chilli. Serve immediately, sprinkled with coriander leaves.